Somewhere along the line, the customer service industry envisioned that it would be a great idea to start scripting everything. On the surface, it seems as though a script allows little room for error. Everyone is representing the company’s stance through crafted statements, and that should leave little room for error. The only problem is that without room for error, there’s also no room for growth. Your scripts may be cheapening the quality of your service, and your customers will notice that immediately. People prefer person-to-person customer service, and that’s the reason why a lot of companies have opted to remove automated troubleshooting services that require customers to navigate their options by touching buttons. If you’re using a robotic script, but having it delivered by human agents, that’s almost worse. You’re defeating the entire purpose of having live agents if you’re using them the same way you would use prerecorded prompts. 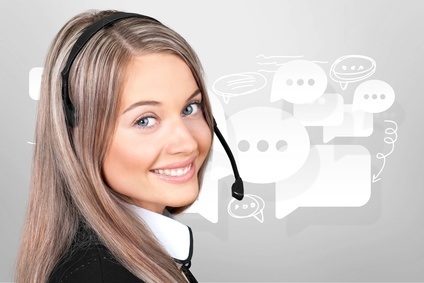 It’s no secret that a lot of customer service agents speak English as a second language. You may think that writing a script to translate as eloquent and fluent will help overcompensate for the language skills that your service language acts, but doing this can only take your agents so far. The second they’re asked a question outside of the script, their language skills will drastically reduce. They’ll become overwhelmed by the vernacular and respond much less impressively. Who writes your scripts? If it’s someone on your corporate team who handles customer service, your scripts may be written too presumptuously. They’re full of corporate pride and excessive branding, and your customers aren’t going to take them seriously. You may have better luck finding a copywriter to rewrite your scripts, placing them in the current universe. Think about how much you’ve put into every other area of your company. You spend tons on advertising and innovating the things you do, in order to become the master of your corner of the market. Then, when your customers need service, you’re turning them over to a subpar script that doesn’t equate to the quality across other areas of your company. Good scripting does more than get the job done – it provides customers with valuable resources that show you care. People don’t call your customer service agents because they’re having a great day and a wonderful experience with your products or services. They’re calling customer service because they’re experiencing an issue. People get angry when they receive an apology that feels like an obligation. Scripted apologies lost in a jumble of a prewritten statement feel patronizing, and your customers are going to feel like you don’t care. When your customers sense apathy, that’s the moment when they become someone else’s customer. One of the most important lessons you should learn about customer service scripting is that scripts should serve as a loose guide, not a strict standard. Make sure your service agents are knowledgeable about your company and what your customers need. Not even the best script can make up for the ignorance of employees who know nothing but the script. Educate your employees thoroughly and consistently. Hannah Dickins is part of the team behind DirectorStats.co.uk. With a huge interest in writing and marketing, she works as a Community Manager. She’s keen on new helpful online tools and productivity hacks. This entry was posted in Articles, Tips and Tricks and tagged customer service script. Bookmark the permalink. Thank you for this. Insightful and spot on in my view. My organization thrives on presumptuous script or templates which is reactive and designed for pushing volumes and little focus on customer service and driving quiality. Great reminder that this still needs to be a very human interaction! At my last company I wouldn’t even allow the word “Script” to be used. We provided guidelines for conversations because at the end of the day it is a conversation.